For the past week and a half we have been trying to keep busy and maintain some sense of normalcy in a far less than normal and ideal situation. My precious father in law started having pain in his leg a couple months ago further to be diagnosed as a DVT and then just as that pain was resolving, pain began in his side and back. Until this week, none of us could have imagined that the root of the pain (and the DVT) is an underlying cancer diagnosis. A cancerous spot was found on his liver last Friday which began a diagnostic odyssey to figure out what exactly is going on. That odyssey is still continuing, despite the fervent efforts of Dr. Schreeder and the other healthcare professionals involved. What we do know is that it is advanced, and the primary cancer has spread to the lymph nodes and liver. The search for the primary site continues tomorrow with an esophageal ultrasound. The hope and prayer is that the definitive diagnosis can be made quickly and so the best chemotherapy medications can be chosen. If all goes as planned, chemo should begin on Wednesday and Gary can really start working on fighting this thing (and getting some much needed pain relief). Ann and Gary are doing an awesome job of sharing the story and updates over on Caring Bridge (http://www.caringbridge.org/visit/garyeast). We are all stunned and grieving to say the least. But we all know who is really in control of the situation and that is our God. We are clinging to Him and the peace and comfort only He can bring. Gary picked Isaiah 41:10 to be the verse of encouragement for this fight. "So do not fear, for I am with you; do not be dismayed, for I am your God. I will strengthen you and help you; I will uphold you with my righteous right hand." So true. We are praying for a miracle and for the doctors and nurses that are taking care of him. We are also praying for peace, comfort and rest for our sweet parents and the whole family. Join us. I also hear there are Team Gary bracelets and t-shirts in the works. It is amazing to see how many people are rallying to join Gary in this fight and how many people he impacts at work, church and everywhere else. I really do have the best father-in-law a person could ask for. I continue to be so blessed to be a part of his family. 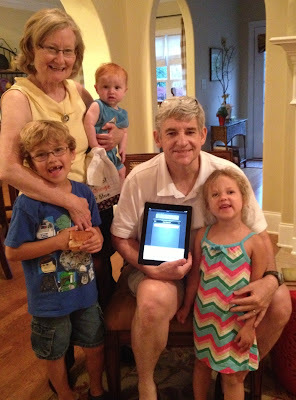 The grandkids did their part the other night and bought Granddaddy an ipad for fathers day to keep him entertained while he sits in waiting rooms and gets treatments. After we got it we rushed right over to give it to him. This has to be one of my favorite pictures of all time.